Las Vegas-based Righthaven LLC is making money by buying out copyrights to newspaper content and suing blogs and websites that violate those copyrights. 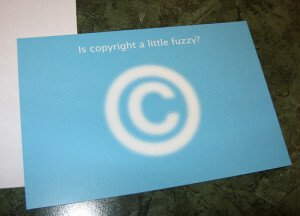 Under the Copyright Act, penalties for a single infringement can be as much as $150,000. Steve Gibson, Righthaven’s CEO, started the company in March. The Las Vegas Review-Journal is the company’s first client, and Gibson has already filed at least 80 federal lawsuits against sites that have reposted the Journal‘s articles without permission. “We perceive there to be millions, if not billions, of infringements out there,” says Gibson. Righthaven’s clientele list has also expanded to include 70 other news properties owned by the Las Vegas Review-Journal‘s publisher, Stephens Media LLC, across nine states. There were some oddities in the way RightHaven was acting, starting with the fact that it gives no warning to sites and doesn’t send a DMCA takedown. It goes straight to suing… and then quickly demands a settlement fee. […] In many cases, it would seem that [the defendants] have pretty strong fair use claims, but fighting a copyright infringement lawsuit in federal court is expensive, which is exactly what RightHaven is counting on. […] This is, clearly, a blatant abuse of copyright law, and not at all what the law intended to do. There seems to be quite a bit of backlash online against Gibson and Righthaven, but I’m not yet convinced that the opposition is right. In an era of declining print media sales and overall news industry struggle, newspapers should be protecting their copyright. Scraper blogs and other automated aggregators are a huge pet peeve of mine, anyway. One of the components we include with each newsblog post is a quotation from at least one respected news source. The laws governing Fair Use are not clear-cut, and neither are our own rules at SixEstate, really. This is an issue that all bloggers should be aware of if they frequently post snippets from news articles or other online content. A general guideline that I use in my own newsblogging and when copyediting others’ work is to include no more than three to five sentences written by another source. That way, the original writing on our newsblogs and the cited material remain in balance. My thoughts on the Righthaven issue may change as the number of lawsuits grows, or as more details emerge. My opinion does not necessarily reflect SixEstate’s opinion as a whole or any of the other bloggers on our team. In fact, I’m sure at least one of them would disagree with me! Image by Nancy Sims, used under its Creative Commons license.